On November 7th, the Society for Implementation Science in Nutrition (SISN), the International Food Policy Research Institute (IFPRI), and the Scaling Up Nutrition (SUN) secretariat co-hosted a workshop session at the SUN Global Gathering in Abidjan on “Sharing Knowledge, Methods, and Experiences on Implementation: How can SUN Countries Better Implement Priority Actions?” The workshop was organized as part of the ongoing Knowledge for Implementation and Impact Initiative (KI3). 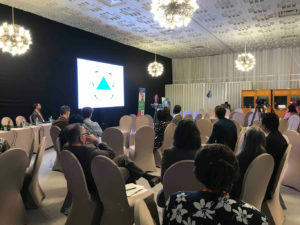 An initiative being jointly implemented by these three organizations, with the overarching goal of closing the knowledge and communication gap among nutrition knowledge generators, policy planners, and implementers in SUN countries. David Pelletier, president of SISN, opened the session by reviewing practical models for framing the role of knowledge in implementation. He then led participants in a rapid exercise to self-assess the state of their countries’ knowledge of the implementation bottlenecks in multi-sectoral nutrition and how they might address them. The exercise revealed extensive knowledge gaps, which guided the remainder of the session. Representatives from the Philippines, Ghana, and SUN’s Civil Society Network then shared country experiences within this sphere. They reported on various positive developments – for example, the development of annual monitoring plans for implementation and the mobilization of global and contextual knowledge by nascent SUN Academic Platforms to support national nutrition policies. They also shared ongoing challenges, such as the need to make nutrition messages more accessible to lay and policy audiences. Workshop participants then continued the rich discussion in smaller groups. In a report-out moderated by Stuart Gillespie (IFPRI), they assessed the strengths and weaknesses of different modalities for sharing implementation knowledge, such as linking national knowledge brokers with their global counterparts, and strengthening the capacity, funding, and support for practical implementation research (IR) that addresses the needs of implementers. With each SUN country being at a different stage of implementation, discussants prioritized the development of context-specific implementation plans, highlighting the value of a toolbox that could support relevant action along the implementation pathway. This workshop represented one milestone in the ongoing work of KI3. 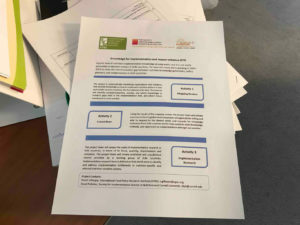 In addition, KI3 is currently undertaking a systematic mapping review of nutrition knowledge providers in order to develop a modality to more effectively share implementation knowledge, and strengthen the capacity, practice, and support of IR in SUN countries.